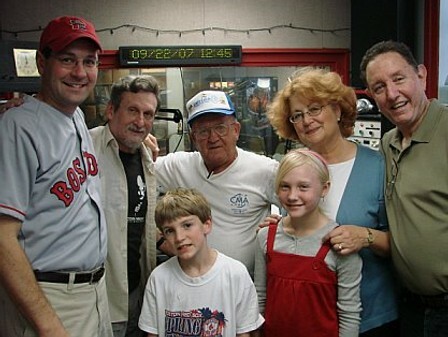 This past Saturday, I was invited to appear on WHRB-FM’s famous country/folk music show, Hillbilly at Harvard, and to perform my song, I’m a Member of Red Sox Nation, live on the air. It’s always been a crazy dream of mine to have a song on the radio, so I didn’t hesitate to accept the invitation. And it was a great time. The show’s host, “Cousin Lynn” Joiner (second from left), made me feel right at home during our interview, and then we filled the studio with my song…. “we” being my co-writers, Michele and Dan Page (right), plus their 10 year-old granddaughter and my 8 year-old son, all of whom sang backup vocals. Who knows how it all sounded out in radio-land, but we had a blast. I want to thank Cousin Lynn for making it all possible. It was an honor to be on your legendary radio show. I was struck by one of Cousin Lynn’s questions. He said, smiling, “So, you’re running for the presidency of a concept?” He was pointing out the absurdity of electing a “president of Red Sox Nation.” Today, I thought more about that. Red Sox Nation…. Is it a band of millions of loyal Red Sox fans? Or is it an emotion? A state of mind? A culture? Well yes, it’s all of these things. But most of all, it’s a way of life. And as I and other members of RSN go through our daily lives, the Red Sox and baseball are literally everywhere we turn. I’m sure your house is a lot like mine…. Our love for the Red Sox is evident in our closets, where our many hats live, as well as in our laundry baskets and our children’s drawers. 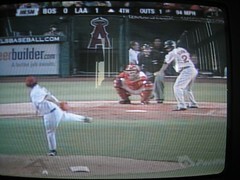 RSN calls to us from our children’s walls and game closets…. … and from our bookcases and the backs of our cars. Wiffle bats and balls reside in the yard (“Fenway West”)…. … along with bases that our kids have stepped on and dove into thousands of times, imitating Mueller or Crisp or Nomar or Roberts. The kitchen isn’t just where we refuel, it’s where we pore over every word and every statistic in the Globe sports section, and where our Kid Nation fridge magnet schedule is displayed proudly. And of course, every night between April and October, the game is on, and with every up and down inning, we relive the great highs and lows we’ve experienced as Red Sox fans over the years. This entry was posted in Baseball, Children, Family, Music, Parenting, Red Sox Nation, Sports. Bookmark the permalink. Inspired. Love the shots of Red Sox house. Thanks Cousin Lynn. Go Rob. Go Sox. plenty of useful data, thanks for providing such information.